11 protected places comprise the Australian Alps National Parks and Reserves. Alpine National Park is one of Australia's largest national parks. The Australian Alps National Parks and Reserves is a group of protected areas found in the southeastern part of Australia, popularly known for being home to the Australian Alps. The area was established in 1999 and later listed in the Australian National Heritage List in November 2008. According to the listing, the region is made up of 11 different national parks and nature reserves, all situated on the Australian Alps. All the nature reserves and national parks cover a combined area of about 4.085 million acres. Of the 11 protected areas that make up the listing, 3 are nature reserves while 8 are national parks. Covering a total area of 1.6 million acres, Alpine National Park is among the country’s largest national parks, and the largest of its kind in Victoria. As its name denotes, the park encompasses the Alpine area of Victoria, Australia as well as part of the Central Highlands. The highest point of the park is the summit of the 6,516-foot high Mount Bogong. This mountain is part of the Great Dividing Range running through the park. One problem experienced in the park is the regular outbreak of bushfires, many of which are ignited by lightning strikes, and end up destroying thousands of acres of vegetation in the park. 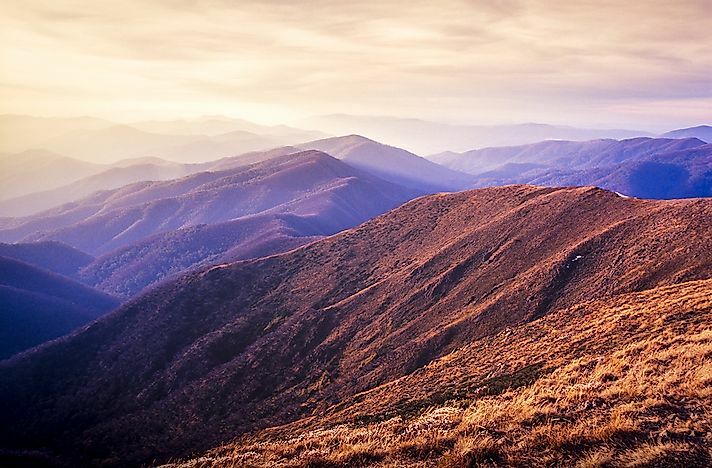 Kosciuszko National Park is a 2,700 square-mile national park found in the Australian Alps. The park is perhaps best known for being home to Mount Kosciuszko, from which it gets its name. The summit of the mountain is Australia’s highest point. Near the mountain is Australia’s highest town, Cabramurra. Mount Kosciuszko is just but one of many peaks found in the park, with others being Mount Townsend and Gungartan. 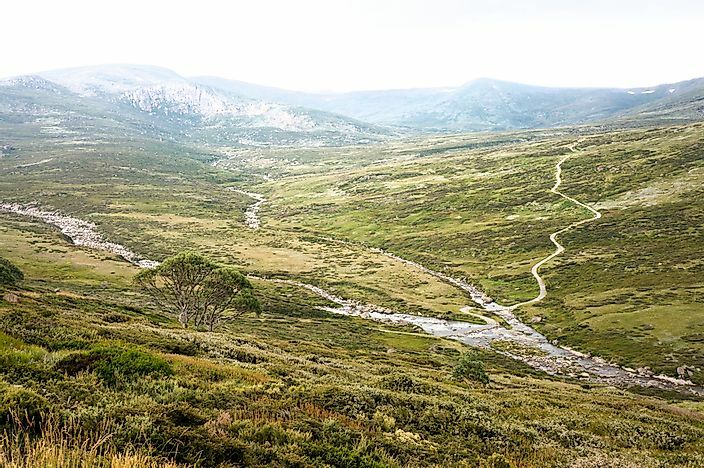 Kosciuszko National Park sits on an important water catchment area, from which many rivers originate including the Snowy River. Baw Baw National Park is another park found in the Australian Alps. The park is among the smallest parks in the region, covering about 33,400 acres. The most dominant feature in the park is the Baw Baw Plateau, from which the park gets its name. South of the park is the Latrobe Valley. The park is of great cultural significance to the Kulin Nation who is recognized as the traditional custodians of the region. Flora found within the Baw Baw National Park is characteristic to the sub-alpine ecological zone and include snow gums and the Baw Baw berry. Another park in the Australian Alps is the Brindabella National Park, situated a few miles from the city of Canberra. The national park covers an area of 45,600 acres and sits on the Brindabella Ranges of mountains from which the park gets its name. Brindabella National Park was established in 1996 and is under the management of Australia’s National Parks and Wildlife Service. Another park in the Australian Alps is the Mount Buffalo National Park, situated near the town of Porepunkah. 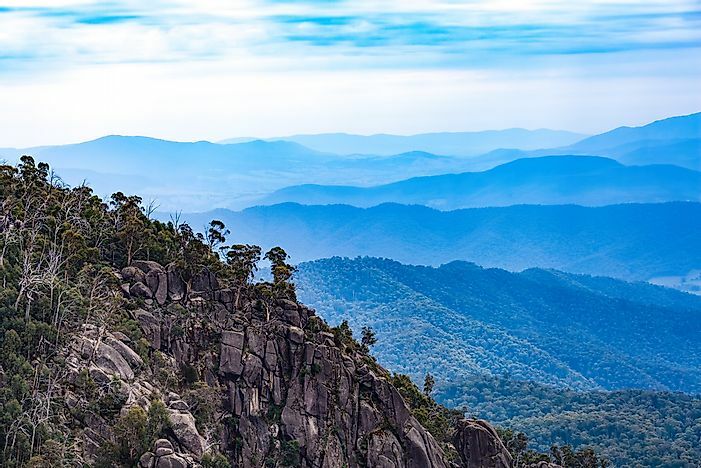 The park is named after its most dominant geological feature; Mount Buffalo, a high mountain plateau with an elevation of 5,653 feet, whose summit known as the Horn offers a panoramic view of the whole park. Established in November 1898, Mount Buffalo is among the oldest national parks not only in Victoria but the entire country. Residing inside the park’s total area of about 120 square miles is a wide range of flora and fauna including a large population of kangaroos, wombats, wallabies, and falcons. Most of the park is covered in snow during winter, making it a popular destination for winter sports. 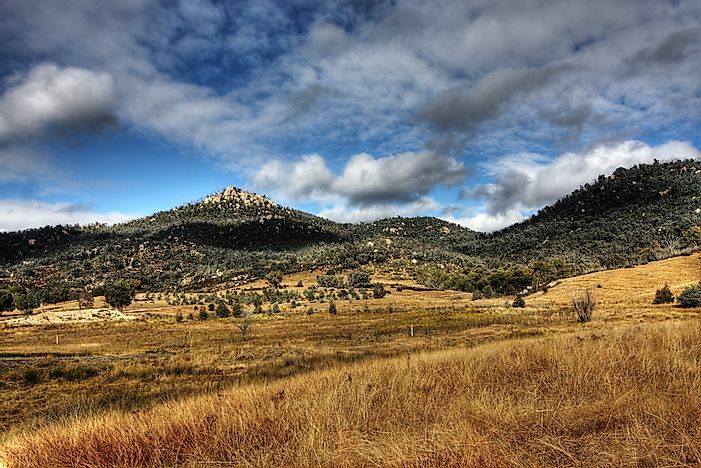 About 25 miles from Canberra is another national park in the Australian Alps; the Namadgi National Park. Situated in New South Wales, the park occupies an area of 409 square miles, making it among the largest in the Australian Alps. The park is a famous water catchment region, with 85% of the nearby Canberra’s water being sourced from the park. The parks cover the northern part of the Alps and have the Bimberi Peak, with an elevation of 6,270 feet, as its highest point. Snowy River National Park is another constituent park found in the Australian Alps. The park covers an area of 0.24 million acres and is located a few miles from the town of Buchan in Victoria, Australia. Found within the park is the deepest gorge in Victoria; the Little River Gorge whose river descends some 2,000 feet below the surrounding plateau. The park was established in April 1979 and is home to an estimated 250 animal species which include the giant burrowing frog and the spotted quoll. A few miles away from the town of Licola is another national park in the Australian Alps; the Avon Wilderness Park. The park occupies an area of about 153 square miles, covering sub-alpine woodland and mountain ash eco-zones. The park was established in November 1987 and is currently under the management of Parks of Victoria. A few miles from the city of Canberra is a nature reserve in the Australian Alps; the Tidbinbilla Nature Reserve. The nature reserve is also relatively small, covering an area of about 21 square miles. Tidbinbilla Nature Reserve is named after the Tidbinbilla Mountain which towers over the reserve. It is home to a rich biosphere, including large numbers of kangaroos, koalas, emus, platypus, magpie geese, and wallabies. The biosphere is, however, recovering after being decimated during a 2003 wildfire which consumed as much as 90% of the entire reserve. The Bimberi Nature Reserve is a protected area in the Australian Alps, sandwiched between the Namadgi and Kosciuszko National Parks. The park is small in size relative to other protected areas in the Australian Alps, as it covers an area of 26,860 acres. Part of the Brindabella Ranges is found in the nature reserve. The nature reserve is named after the Bimberi Peak, the highest point in the region. Another nature reserve in the Australian Alps is the Scabby Range, which is situated in New South Wales. It is about 37 miles south-west of the city of Canberra and is made up of two parcels of land that covers an area of 4,982 hectares. The reserve was established on December 3, 1982. Within the reserve are a wide range of flora and fauna and to the south-west is home to the native grassland. The nature reserve is also home to the rocky outcrops and the moist subalpine forest. The Bimberi wilderness occupies the most of the reserve. How Big Are The Alps?